Tasty Appetizing Smoothie Bowls Served In Half Pineapple Decorated With Cut Passion Fruit, Coconut Flakes, And Chia Seeds.Healthy Life Clean Eating Concept. Top View. Lizenzfreie Fotos, Bilder Und Stock Fotografie. Image 114631455. Standard-Bild - Tasty appetizing smoothie bowls served in half pineapple decorated with cut passion fruit, coconut flakes, and chia seeds.Healthy life clean eating concept. Top View. 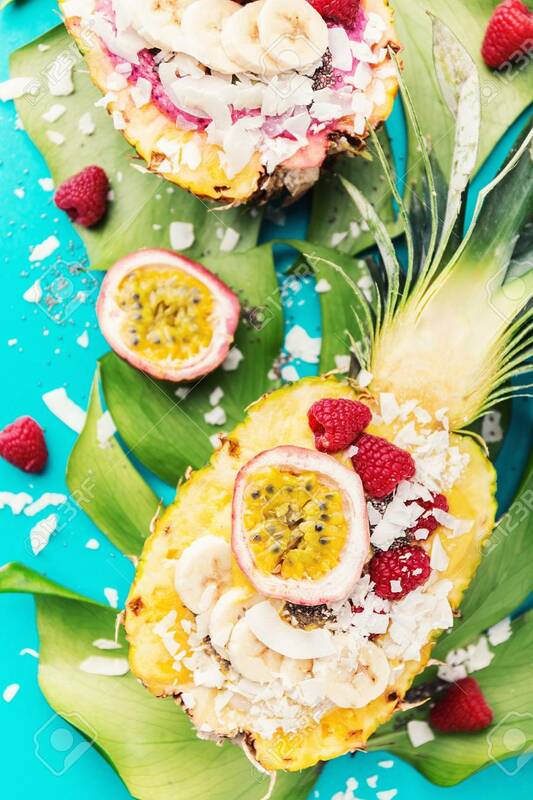 Tasty appetizing smoothie bowls served in half pineapple decorated with cut passion fruit, coconut flakes, and chia seeds.Healthy life clean eating concept. Top View.